Got NSInternalInconsistencyException? Decrement data source's row numbers before deleteRowsAtIndexPaths call. - It works! Got NSInternalInconsistencyException? Decrement data source's row numbers before deleteRowsAtIndexPaths call. 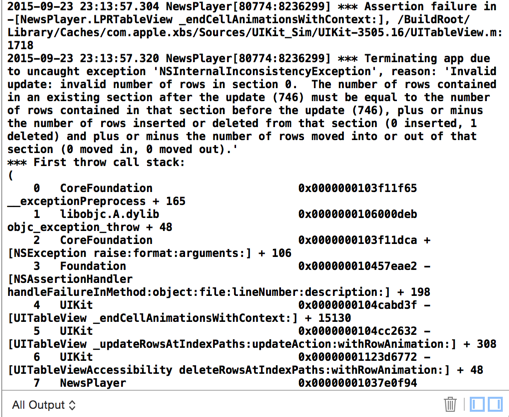 I got an interesting error message about NSInternalInconsistencyException. Let me brief this sentence, it says "The number 746 must be equal to the number 746". Wow, I didn't know 767 and 767 are not same number. Yes, I know I should inspect my code closely AS THEY SAID. In my case, of course it was my fault. The reason for this Exception is that I didn't refresh data source's row numbers before deleteRowsAtIndexPaths call. P/S Here's the whole error log from my app.